If only your smart, witty best friend were a talented designer. Imagine the fun you’d have making your living space into something personal and pretty, and that works for you too? Plush rugs for bare feet. A soaking tub that doesn’t make your back stiff. A laundry room that hides the cat box. Followers of HGTV’s Design Star and author Emily Henderson’s blogfeel as if they’re getting solid advice from a friend, along with observations served with humor. According to Henderson, before you install a rain-like shower head, consider if having “water in your eyes for 20 minutes is annoying.” She then suggests other options. In a Portland home remodel, she installed three types of nozzles, including a handheld one. “I want this shower so badly,” she coos in her blog, Style by Emily Henderson. For a year, her fans have been reading about her ambitious project to transform a serviceable 1980s daylight ranch in Dunthorpe into a three-story showstopper. The property at 02008 SW Military Road, which Henderson’s brother Ken Starke and his wife bought as an investment in January 2017, is now back on the market at $2.6 million. But don’t call this a flip, instructs Henderson, who grew up in Coos Bay and Lake Oswego, and lives in Los Angeles with her husband and children. “I mean, who buys an $850,000 flip?” she wonders, and then who invests in high-end doors and other custom features to create a larger, upscale and livable house on a newly landscaped property. She wanted the remodel, for a yet-unknown client, to be timeless, classic and worthy of the neighborhood. There would be “splurge-y finishes,” typically beyond her budget, but the end result would be “still ‘me,'” she says. Henderson specializes in coaxing a fresh flavor from formal elements — from edgy marble mosaic tile to lantern sconces. She describes the style that guided her in this project as a combination of simplified traditional and California casual. A quicker way to say it: Traditional in a modern way. Walls have been taken away to open up chopped-up interior spaces that now ease into the outdoors. Large, black-framed windows allow people to peer out to lounge chairs near the lawn and sleek glass French doors open to a deck warmed by a fireplace. 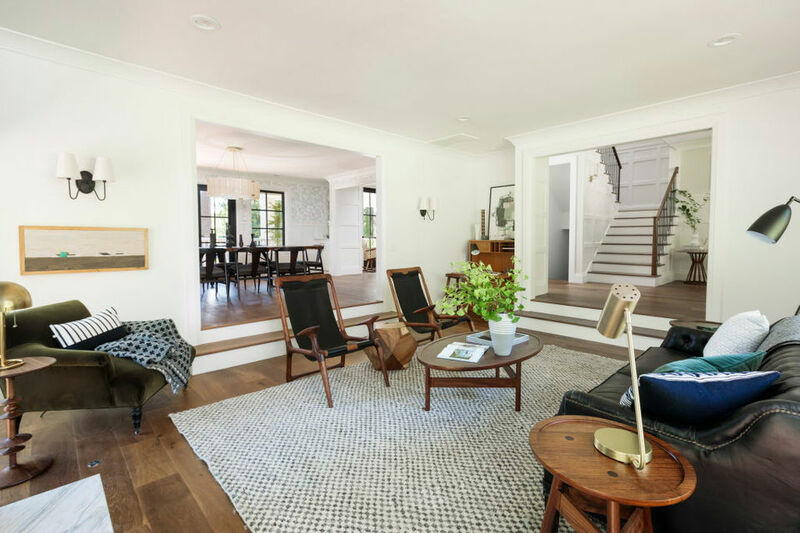 Dramatic changes were made on every level: The dreary daylight basement has been updated and integrated into the entire house, prompting it to be renamed the “ground floor” by Henderson and her design team. Here, people enjoying the media room and wet bar can easily step outside to the new patio. Or they can wander around inside to see two light-filled bedrooms, a white-tile bathroom and a huge, attractive laundry room that Henderson has long fantasized about. The second floor, which sits at street level, now has a wide covered front porch. Open the double front doors to an enlarged entry. Walls have been removed to step down to the updated living room and a large office has been reconfigured to accommodate stairs to the top floor addition. The main floor’s most used space — the scrunched-up family room, kitchen and breakfast area — has been granted breathing room. A fireplace wall between the family room and the original master suite is gone and the master suite is now an elegant, but not stuffy, dining room with views of the yard. The third-floor addition has a new master suite with romantic open trusses and a private deck. A sitting area faces a fireplace, one of four in the house. Although most of the walls in the almost 5,000-square-foot house are painted a warm white, Henderson selected charcoal Dark Cyberspace by Sherwin-Williams for accent walls here. It’s a cool backdrop to the large glass shower and two vanities: “No more sharing, folks!,” she writes. Keep going to find the handsome walk-in closet with plenty of built-in storage. Two more bedrooms also benefit from the view on the top level. For convenience — a big consideration for Henderson — there is also a small laundry room. Towering trees shade the 0.7-acre lot, which also has a bocce court. 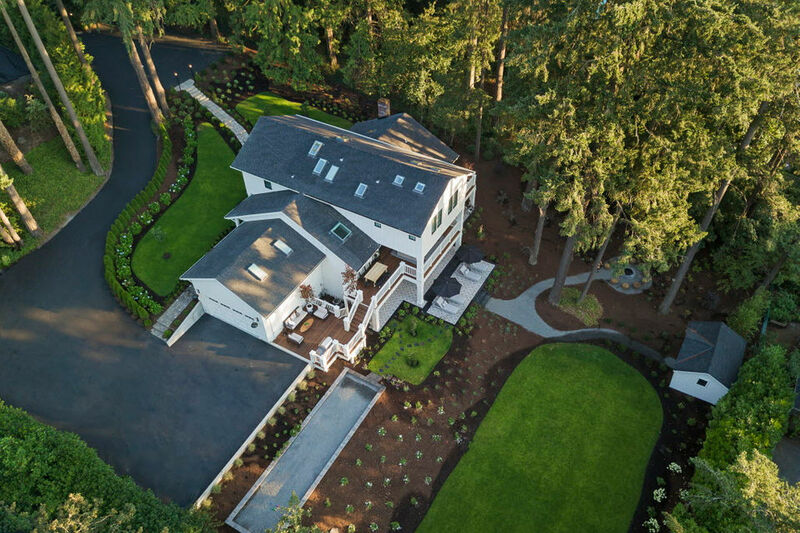 Real estate agents Alex Sand, Christy MacColl and Carrie Gross of Windermere Realty Trust said this was the first time one of their listings was covered in social media while under construction. 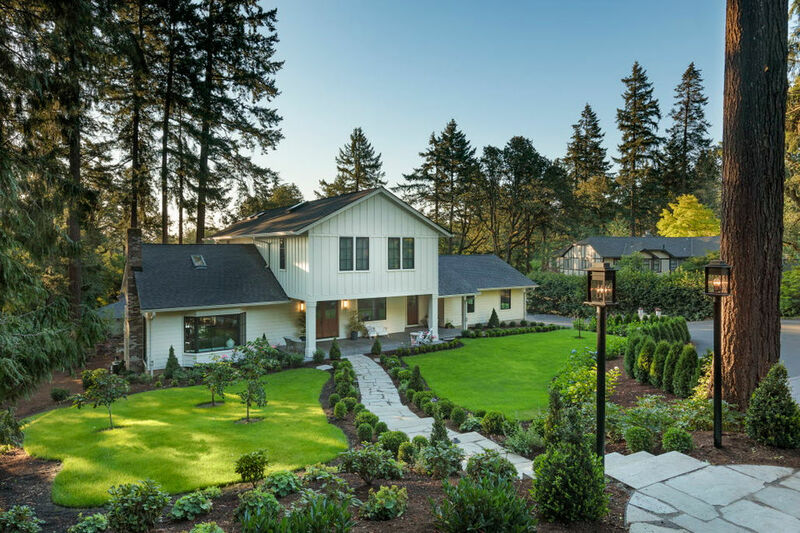 Although the project has her brand name attached to it, Henderson credits product sponsors and the remodel team, including Portland-based general contractor JP Macy of Sierra Custom Construction and architect Annie Usher. The new owner, writes Henderson, will be buying a well-designed, basically brand new house that can be purchased fully furnished, an idea the busy working mom covets.